I have to admit I haven't been an avid follower of Marvel comics for quite a while. There just isn't enough time and money to keep up with all the great comics that come out every Wednesday. 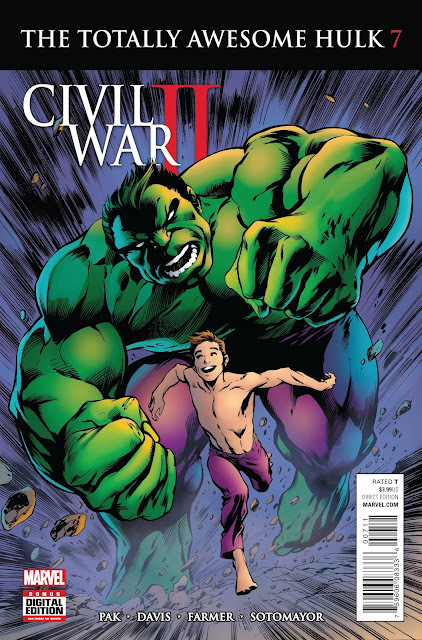 I was afforded an opportunity to review Totally Awesome Hulk #7 by the talented Greg Pak and Alan Davis and I'm glad I did. Having followed Hulk in the 80's and on television there's something inherently melancholy and tragic about Bruce Banner that endears him to fans. I could relate because who hasn't been angry enough to want to stomp on a bully or fight some other injustice. As a gamma-radiated avenger that's larger than life, I could do just that. However, it's a heavy burden to carry with you when you have a raging monster inside of you. In this Civil War II tie-in, Bruce's 8-month disappearance is explained bringing what appears to be some happy closure to his battle with the beast within him. Amadeus Cho took upon himself to save Banner and many others by absorbing all the nuclear radiation that was going to set him off like a bomb. Now Cho is the Hulk and to Banner's great relief and surprise is cured. Pak draws a great contrast between the once and former Hulk and the new one. Cho is brimming with joy and bravado as he relishes his superhero status and Banner is incredulous and happy just to be normal again. He wonders if it's for real this time but seeing him ecstatic is heartwarming to see after all he's been through. He takes his new found "freedom" to extremes. So much so a concerned Tony Stark intervenes and leads to a chilly reception at first from Banner. How does a world without Bruce Banner as the Hulk look like? So far it's very zen-like and with the younger brasher Cho out there saving people with exuberance and cockiness he may be what this world needs now. Banner has, for now, had a huge burden taken off his shoulders. Alan Davis and Chris Sotomayor do a great job overall but so much of the story is dependent on the characters' emotions. That's conveyed brilliantly with joyful expressions from both Banner and Cho. Sotomayor's color are vibrant and bold but keeps Banner humble in muted earth tones implying his down to earth and now normal existence. Davis creates a dynamic layout that sometimes stuffs a page with panels but doesn't hamper the pacing. 'Totally Awesome Hulk' #7 can be seen as a lot of things. A necessary but all-consuming showcase for Banner amid a Civil War II tie-in that leaves Cho as a cameo in his own title. On the other hand, there is a sense of peace and happiness to Banner that has been earned and maybe won't be for long but seeing his burden lifted and his tortured soul emancipated is a revelation. TAH #7 is a love note to fans of Bruce Banner and I for one cherish it.